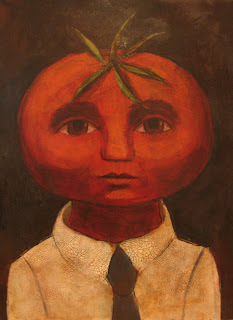 Northdixie Designs: Tomato Boy is Done! Well, here he is - I tried to capture the feeling of boys between 8 and 13. They can be so sweet and earnest. He looks like he's dreaming of inventions (a new-fangled irrigation system for farms? Prevention of the Tomato Hornworm?) If you click on the painting you can see closeups of the texture. The real reason I like crackle medium is because of the texture it creates - because of course anyone knows that this painting isn't old. I made him as a companion piece for the painting below. So now I'm at that point where I need to decide the next thing to make - doll or painting? Big or small? Cloth or Paperclay? It's a really fun place to be. He is wonderful, Dixie. 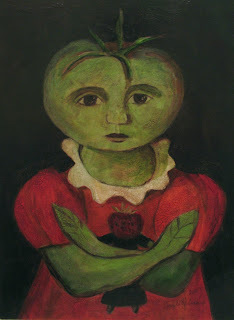 I love the expressions on your people (Tomato & Red Riding Hood variety). I vote for a painting!